✓ This multi-cooker is one of the most versatile appliances that can cook everything from casseroles and soups to vegetables, rice, roast beef, pork, and poultry. ✓ This multi-cooker is is fully machine washable. All you have to do is remove the heating control unit and you can put the tempered cover and the container in your dishwasher. ✓ You can use the basket that comes with this multi-cooker for steaming, blanching, and deep frying. It simply snaps onto the rim of your multi-cooker for easy draining. 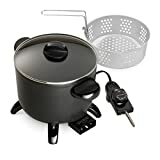 If you are looking for a really affordable and convenient way to cook some delicious meals the Presto Multi-Cooker and Steamer might be perfect for you. 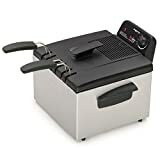 This multi-cooker gives you the versatility and the ability to do anything that you can imagine, from frying foods to blanching vegetables, roasting meats, boiling pasta, and making soups and stews in one device. This multi-cooker provides the kind of convenience and variety that you will want to use it every day. Why would someone want to buy a multi-cooker? The biggest reason that anyone would want to get a multi-cooker is because it saves so much time. Much like a slow-cooker or any other kitchen appliance that you can set and forget, you can easily drop just about any kind of food that you want into this multi-cooker, and it will do all of the work for you. It eliminates the hassle of spending hours in the kitchen every night to make a decent meal for you and your family. The Presto Multi-Cooker and Steamer won’t take up a lot of space in your kitchen, and it is so handy with everything that it can cook that you just may use it to make something every day. So what are some of the most important key features of this multi-cooker? This multi-cooker comes with an easy to use temperature control dial that lets you set the temperature for anything that you need to cook or prepare. The temperature control allows you select the temperature that you want to cook at from 200 to 400 degrees fahrenheit. 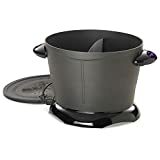 It also includes a warm feature that you can use to keep your food warm while you are eating, or while you are finishing preparing the rest of your meal. The temperature control easily slides in and out of the multi-cooker. If you love frying your own foods at home, you are going to love this multi-cooker. The Presto Multi-Cooker can do an excellent job as a deep fryer. It comes with its own fry basket that you can simply snap onto the brim of the container. 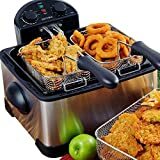 It will take a little while to heat up your fry oil, but the multi-cooker can fry up to six cups of french fries at one time. Then you can simply snap off the basket to clean it, when you are done frying. This multi-cooker gives you so many options that you may end up using it to cook something every day. 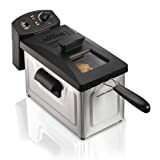 Ease of Cleaning is one of important features you need to consider when selecting the best deep fryer for your cooking need. Another nice feature that we really appreciate about this versatile cooker is that it is really easy to clean. When you are finished cooking, just remove the temperature control, remove the frying basket if you used it, and you can place your multi-cooker container and cover right into your dishwasher. The fact that the main components of this appliance are dishwasher safe make it really easy to clean and reuse. Overall, we would highly recommend this versatile multi-cooker if you need a faster, more convenient way to cook and prepare food in your kitchen. It is relatively inexpensive, and will save you a lot of time and headache when it comes to preparing food.